The opening scene of John Maclean’s feature-length directorial debut finds romantic young Scot, Jay (Kodi Smit-McPhee), gazing at the night sky, and reeling off the names of constellations. While a lone figure bedding down under the stars is a staple of the western, the way in which they light up when Jay points his gun at them establishes the mystical and dream-like episodes which pervade this otherwise gritty little film. Maclean’s musical background is apparent in both a lovely soundtrack, and little glimpses of magic which wouldn’t look out of place in a music video. 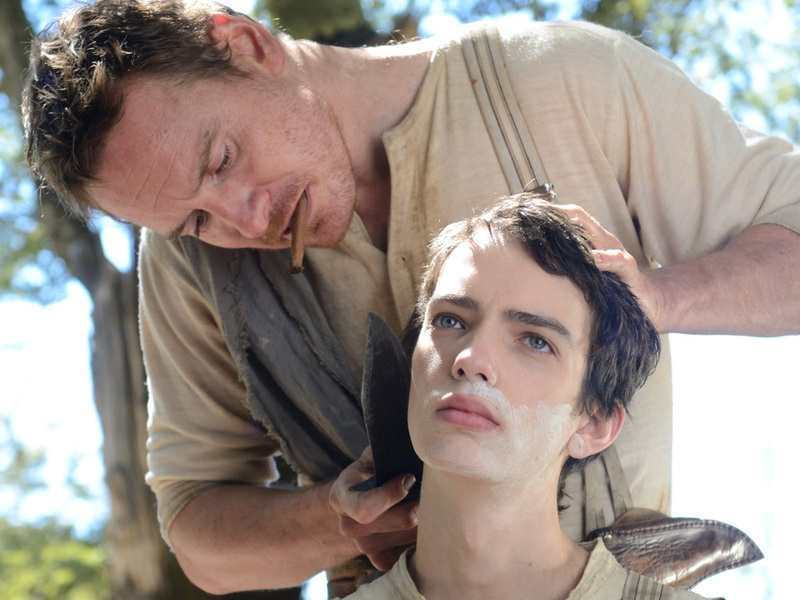 Slow West could be The Searchers directed by Gregg Araki. Teenager Jay is a hopeless romantic, a “jackrabbit in a den of wolves”, who has travelled from Scotland to Colorado, seeking his true love, a girl named Rose Ross (Caren Pistorius). When he’s accosted by some unsavoury sorts in pursuit of a Native American in the forest, his life is saved by bounty hunter, Silas (Michael Fassbender). Silas realises Jay has money, and offers to get him back to Rose in one piece for all the cash in his pocket, an arrangement which the naïve youngster reluctantly agrees to. Through a series of tantalising flashbacks, we come to realise that perhaps Rose and Jay’s relationship isn’t quite the great romance he thinks it is, and that Jay is inadvertently responsible for the $2000 bounty Silas discovers has been set for bringing in Rose and her father (Rory McCann). The pair wind their way cautiously through vast landscapes so sumptuous and beautiful that they are like something from a fairy tale, and this only serves to underscore the brutality and senselessness of the violence they encounter along the way. This is a land of the dispossessed and the exiled, a kind of purgatory for those who have left behind another life, a hostile wilderness where mistrust runs rife and survival is paramount. But whilst Silas expects that danger lurks behind every tree and under each rock, we see the world very much through Jay’s wide eyes. In a surreal moment which brings to mind Jim Jarmusch’s 1995 film, Dead Man, Jay meets a small band of Congolese musicians and converses with them in French about the universal nature of love and death. This is the crux of the film. Both are unavoidable. Both can be torturous. Indeed, Jay’s shock and sadness at each bloody demise he witnesses culminates in his epiphany that love can be equally painful at the film’s climax. But the tragic nature of this tale is shot through with wry resignation and gallows humour. In one scene, Jay and Silas come across the skeleton of a man pinned under the tree he was felling when he met his end, and muse on the concept of natural selection. The absurdity of the situation, and of life and death in general, is echoed in the film’s bullet-riddled conclusion as we see the corpse of a bounty hunter with his arse exposed. There is nothing dignified or glorious about his death, just one final insult. This notion is also reflected in several visual gags, most notably a literal sprinkling of salt on a wound, and Rose’s inability to keep butter from melting. While the burgeoning friendship between Silas and his young charge is central, we actually learn very little about the bounty hunter’s backstory. Repeatedly referred to as a brute by Jay, Silas is not squeamish about meting violence, but neither does he seem to particularly enjoy it. It’s hard to see him as a truly bad guy. Ben Mendelsohn, however, is typically chilling as Payne, a fur-draped, absinthe-swilling former associate of Silas’ who catches up with the unlikely duo and spends a tense, drunken night in their camp, trying to woo Silas back into the fold, and eyeing his young companion like one of the hungry wolves that howl in the distance. We never get to learn exactly what went down between Silas and Payne to cause the parting of ways, but something in their charged and intimate exchange suggests it was about more than cash money and Silas’ conscience. Indeed, emotional attachment and death are conflated throughout the film. Parental desperation ends in tragedy. Jay’s desire to find a kindred spirit is almost his undoing. There’s physical tenderness between Silas and Jay, most notably in a scene where the older man shaves the boy’s face with a knife but there’s a whiff of danger in it too, especially when Jay claims to know Silas’ real motive for helping him. Jay’s assertion that the bounty hunter is lonely, however, has the ring of truth about it. Similarly, Silas’ harsh ministrations when Jay is shot with an arrow, and the older man’s forcible attempt to prevent the boy entering a shoot-out situation reiterate the notion that love and brutality are inextricably entwined. Smit-McPhee, who came fittingly to light in the big-screen adaptation of Cormac MCarthy’s The Road, is perfectly cast as Jay, an innocent forced to watch his ideals shattered into a million pieces but equally unable to turn from his destiny. He’s almost Christ-like, a sacrificial lamb sent to show Fassbender’s Silas a path back to his humanity, and to teach him that there can be more to life than just surviving. We’re left with a sense that Jay and Silas’ shared absinthe-induced dream of a possible future has indeed come to pass, and it’s both a hopeful and heart-breaking ending. Lyrical, strange, and lean, Slow West doesn’t over-explain or outstay its welcome, yet still manages to wrangle the largest, most fundamental, and timeless of subjects. A little film with a big, broken heart. Review: Sharknado 3 – Oh Hell No! New Adult Scavenger Hunt: Spring 2015 – it’s coming!